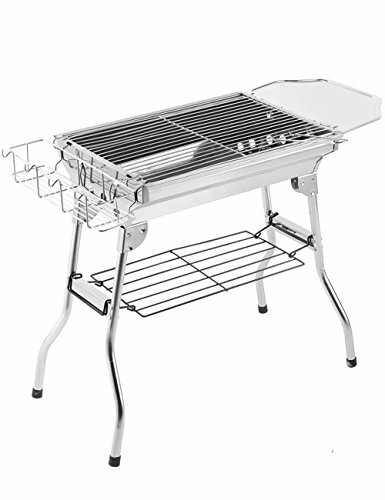 The Menschwear BBQ Grill is constructed with industrial grade stainless steel for durability and long lasting performance. Smooth parts prevent cuts and other injuries during assembly. The grill comes with an easy-to-follow instruction for stress-free assembly without tools. Perfect for camping,backpacking,picnics,tailgate parties,camping,trailers,parks,and grilling in small spaces. Note:In addition to some basic components of the grill,it also includes a hanging basket and a spice board for free! 1.Use a special stainless steel cleaner or warm liquid detergent with warm water to clean up,avoid using irritating detergent such as bleach. 2.You can avoid scratching the grill by using a soft cloth or fiber cloth,remember to clean along the grill's texture. 3.Please dry immediately after cleaning,do not let it damp.